Body Brushing For health, beauty and longevity. What: dry surface brushing of the skin, enough pressure to make your skin slightly pink, but not enough to cause pain or discomfort. Always brush toward the heart and lymphatic drainage sites. Used historically in India, China, Japan, ancient Greece, and by Native Americans. 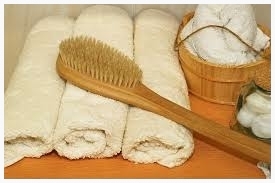 Why: Dry brushing removes dead skin cells, reduces celulite, improves circulation, muscle tone, and oil gland production. It is also helpful in detoxifying the lymphatic system, strengthening the immune response and stimulating hormone glands. How: Brushes are the traditional tool, but anything from washcloths to exfoliating gloves will work. Dry brushing creates better contact and skin response than wet (wait to bathe till after brushing so that any exfoliating of dead skin cells can be washed off). Start at the ankles, move up with long strokes and shorter circular strokes at the joints, arms and torso brush towards the heart.